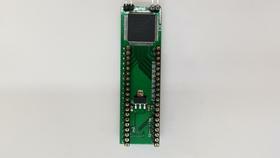 Introducing BoysonTech Guardian+ CPU DAT board with buffer protection. Full CPU buffer protection built into the Guardian+ including NMI, HALT, IRQ, RESET, FIRQ, and DMA/BREQ lines. Disable 2Meg jumper for non-patched Original Sierra games and other programs that only work with 512kB RAM. Programmable Tricolor LED to illuminate the inside of your CoCo3. Professional installation available at an additional cost. Email for details. The upgrade requires the removal of the soldered in Motorola 6809 CPU chip and replaced with a CPU socket. A machine socket is included with the kit. It is highly recommended that the socket should be installed by experienced bench technician. The CoCo3 is a 30 year old computer and can be easily damaged by an inexperienced person or by improper solder equipment. Professional installation is available - contact BoysonTech for details.